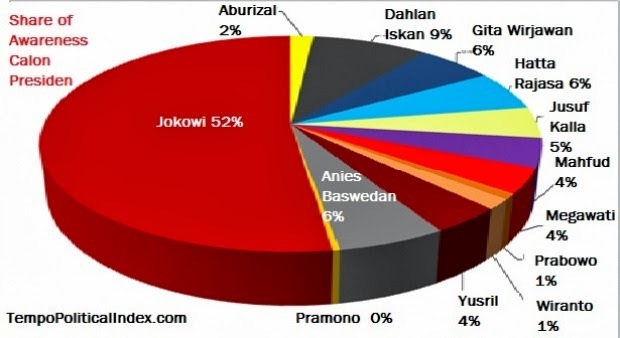 Indonesian Survey Circle (LSI) founder, Denny JA, predicts four likely scenarios following the legislative election, which will take place on April 9. First, two political parties – the Crescent Star Party (PBB) and the Indonesian Justice and Unity Party (PKPI) -- are expected to fail to pass the parliamentary threshold as their votes will be below 3.5 percent. Secondly, the 2014 elections will result in six lowest-ranking political parties with votes of between 3.5 percent and 8 percent. “The six political parties are the National Awakening Party (PKB), the Prosperous Justice Party (PKS), the Hanura Party, the NasDem Party, the United Development Party (PPP), and the National Mandate Party (PAN),” said Denny on Monday, as quoted by tribunnews.com. In the third prediction, the 2014 election will result in two middle-ranking political parties with votes of between 8 and 16 percent. They are the Gerindra Party and the Democratic Party. “The winning party [either the PDI-P or Golkar] will be the party which is most capable of attracting undecided voters, who are predicted to amount to 10.6 percent, and the party which manages to minimize the level of abstaining voters [golput] among its supporters,” said Denny.